Seafood made the right way! The story began long, long ago on a bright and sunny afternoon in Louisiana’s Atchafalaya Basin (the big swamp next to N’awlins). The cousins, Boudreaux and Thibodeaux were busy setting trotlines and crab traps; preparing, as they normally did, for an evening of catchin’ crabs, catfish, giggin’ frogs, trampin’ flounder and huntin’ alligators. Suddenly, the wind started howling, the water started rising and the sky turned black! Obviously, one heck of a tempest was a brewin’ (Hurricane Katrina) but before the cousins could escape to higher ground, the levee broke and washed the two fellas out to sea where they drifted to Houston, Texas. After three days of floundering in Buffalo Bayou, the boys hit dry land and you can bet they were hungry! Since then, they’ve been spotted all over Houston, Galveston and the Clear Lake area looking for their kinsmen and Crazy Alan’s Swamp Shack. Here at Crazy Alan’s Swamp Shack, we make seafood the right way! 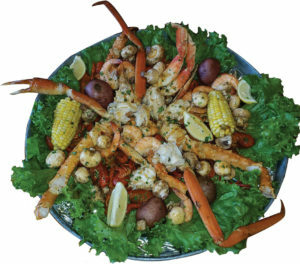 All our seafood is expertly prepared to the highest standards and includes mouth-watering Cajun seafood, delicious snow crab and even whole, live Maine lobster. If you love your seafood, then you will love us! With two great restaurant locations, in front of Baybrook Mall and Kemah, we’ve got your seafood needs covered. If you’re out shopping at Baybrook Mall or visiting the Kemah waterfront, stop in for some of the best crawfish in the great state of Texas, there’s no need to think about where to eat anymore. We’re open from 11am to 10pm during the week, and from 11am till 11pm on the weekends. Anytime you want to take advantage of our great prices and delicious food we’ll welcome you with open arms. Now that there’s no more excuses, you’d better come down to Crazy Alan’s Swamp Shack this weekend! Over here at Crazy Alan’s Swamp Shack we cater for the whole family. With our team of friendly, welcoming staff, and fantastic menu, we’ve got a recipe the whole family can enjoy. Imagine that, no more arguments about where to eat! 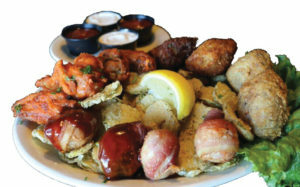 Just another reason why you should make Crazy Alan’s Swamp Shack your Cajun seafood restaurant of choice. Cajun seafood? Check. Amazing burgers? Check. Year-round crawfish? Check! Something for everyone? Check! At Crazy Alan’s Swamp Shack, you’ll be spoiled for choice when you look at our menu. With over 30 unique dishes and delicious seafood pots to get your taste buds tingling, we’ve got something that you’ll enjoy and keep you coming back for more. For more information or to grab a table at one of our two restaurants, contact us now!